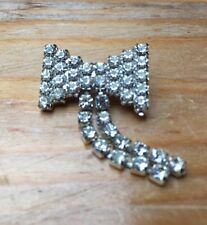 Sparkly Vintage Large Crystal Rhinestones Bar Brooch Silver Tone. Rollover clasp. 17c marked on back. Good condition. Beautiful designed pendant, lovely colours on the accents. Six sparkly brilliant rhinestones bring to life this bar brooch. If other options are available, they are listed. Circa 1960s / 1970s judging by the clasp. If other options are available, they are listed. Good quality and nice and sparkly. Fastens with a roll over style safety clasp at the back. Matching curved clip on earrings tapering to a single stem of rhinestones. Brooch is 6cm long, earrings 2.5cm. Signed Napier, this bracelet features a fold-over clasp. The bracelet hallmarked Napier in the clasp. They are in a silver tone wire work over a frosted pink square and set with pink and purple rhinestones. Very unusual. At first, I thought one earring may have been bent but I don't think so as the wire work is quite tough and hard to manipulate so I suspect this is how they were made. Very good, clean condition. All stones present. Original Art Deco dark sterling silver dress / hat clip. 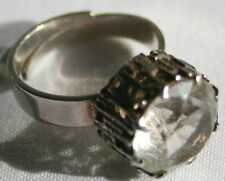 It is hallmarked “sterling silver” and also has the mark of the maker. In good, uncleaned condition. It weights 6.8 grams. All the rhinestones are intact. Condition : Great condition - could be a little earlier than 1950s, this is silver tone despite the photos that show a slight yellow tint. That's the light this was taken under. Lovely high neck necklace with beautiful sparkle. Would guess is 1980's or so made age but with a bit of an Art Deco look but may could easily be a bit either side. Fastens with a c shaped clasp. Solid and heavy with two rows of rhinestones joined together. Standard pin with rollover clasp(brooch) in good working order. Weight approx. 17grams(brooch), bracelet - 16grams. Clip ok but one is a little looser than the other. Small but solid and nicely made. The centre and edges are set with clear sparkly rhinestones, most with an AB effect. two stones on the edge (the one to the top and one on far right) I think have been replaced as these are just clear without the aurora borealis/iridescent effect though this isn’t overly noticeable at a glance. Antique tested Silver and Rhinestone / Diamante Jewellery : Large Buckle. An Antique large tested silver & rhinestone / diamante Buckle. Good Antique Condition. Pretty vintage multi-tinted rhinestone necklace. One rhinestone missing. In good condition. The bracelet is a rope design bracelet with lobster fastening, also stamped 925, used and in lovely condition with minimal wear. The earring are stud earrings in pear drop shape with a faceted grey stone surrounded by glistening rhinestones, they are stamped 925, used and in a very good condition almost as new. 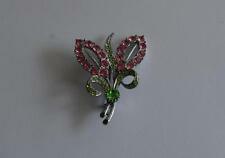 Vintage Sparkly Rhinestone Flower Brooch/Shawl Pin/Crystal/Retro/60’s GUC. Dispatched with Royal Mail 2nd Class. From a pet smoke free home, any issues please contact me prior to leaving negative feedback. Payment via PayPal within 48 hours. Thanks for looking!